A conversation with Silicon Valley venture capitalist Steve Jurvetson is the intellectual equivalent of an amusement park ride - thrilling and dizzying, with unexpected turns and twists taken at a breakneck pace. Jurvetson has an uncanny ability to find connections between scientific fields ranging from nanotechnology to renewable energy, with a high-octane curiosity and enthusiasm. I interviewed Jurvetson at DFJ, the venture capital firm where he has backed top tier startups such as Hotmail, Skype and Baidu. Jurvetson is also an unabashed space geek, with a love for rockets and engineering instilled as a boy during summer stints at Space Camp. 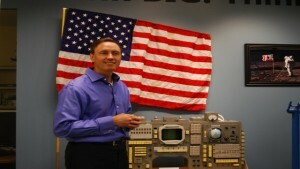 Today, he fires off amateur rockets with his children and collects uber-rare space memorabilia, including an original Apollo-era fuel cell, the prototype of the US flag planted on the moon by Buzz Aldrin and a control panel salvaged from a Soviet-era Soyuz spacecraft, all on display at his Menlo Park office. Jurvetson has secured tens of millions of dollars for billionaire entrepreneur Elon Musk's startups, including the electric car maker Tesla Motors and SpaceX, a rocket-building and launch services company based near Los Angeles that has Jurvetson on its board. When I interviewed him this spring for the new KQED Science documentary, "Silicon Valley Goes to Space", I was keen to get his thoughts about the new flurry of commercial space ventures launched by Musk and other successful, tech-savvy entrepreneurs, including Microsoft co-founder Paul Allen, Richard Branson and Amazon CEO Jeff Bezos. "You’re dealing with big things that blow up on the pad. And in many cases, the need for a lot more money to get into space." As Jurvetson pointed out, some of these new space startups aren't based in Silicon Valley. But the world's capital of high-tech innovation has played an out-sized role in influencing and spurring the innovations and efficiencies that are allowing companies like SpaceX and Virgin Galactic to compete with and, it could be argued, out-innovate Boeing, Lockheed and other titans of the aerospace sector. "Part of it is the culture, the willingness to take risk," Jurvetson said. "Whether it’s Tesla Motors and electric cars, SpaceX with rockets, some of the satellite companies that are thriving here, they are willing to approach things differently, re-engineer the problem, and radically change the landscape." What do venture capitalists look for when evaluating startups in need of funding to overcome some hefty hurdles in the space industry? "You’re dealing with nation states as your competitors," he said. "You’re dealing with political processes. You’re dealing with big things that blow up on the pad. And in many cases, the need for a lot more money to get into space." According to Jurvetson, succeeding in the space startup world requires attributes common to any successful high-tech startup. In fact, one of the defining features of the new space era now underway is the appropriation of design and engineering strategies commonplace within the tech sector. This means that it's much easier today than just five or 10 years ago to test and modify rocket designs, launch systems and robotic landers and innovate the "modular reuse" of hardware components such as SpaceX is doing with its Falcon 9 rockets. Ultimately, making it in the cutthroat world of startups requires perseverance, focused leadership and innovation, he said - traits that could apply just as readily to a startup making software or a startup making rocket ships to possibly ferry passengers to a space hotel or even Mars some day.